At times, due to our own history of pain and trauma, when we are faced with the suffering of loved ones and others around us, we may experience that the love and compassion we would like to show them is blocked and inaccessible. How then can we reconnect with our innate capacity for that love and compassion, and our ability to to care for them in the way would most wish in our heart of hearts? One of the great impacts that the publication The Tibetan Book of Living Dying had was through introducing the wider world to the practice of Tonglen, a practice for developing compassion through taking on the suffering and pain of others, and giving them your happiness, wellbeing, and peace of mind. Before you can truly practice Tonglen, you have to be able to evoke compassion in yourself. That is harder than we often imagine, because the sources of our love and compassion are sometimes hidden from us, and we may have no ready access to them. Fortunately there are several special techniques that the Buddhist “training of the mind” in compassion has developed to help us evoke our own hidden love. In this teaching, Rinpoche explains one of these techniques, that of considering others the same as ourselves, and how it prepares us for the actual practice of Tonlgen which is explained in Chapter 12. 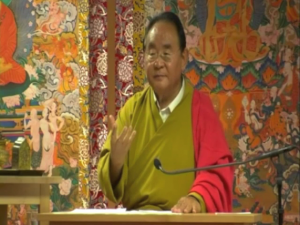 For further teachings by Rinpoche on training the mind in compassion, please visit SogyalRinpoche.org.